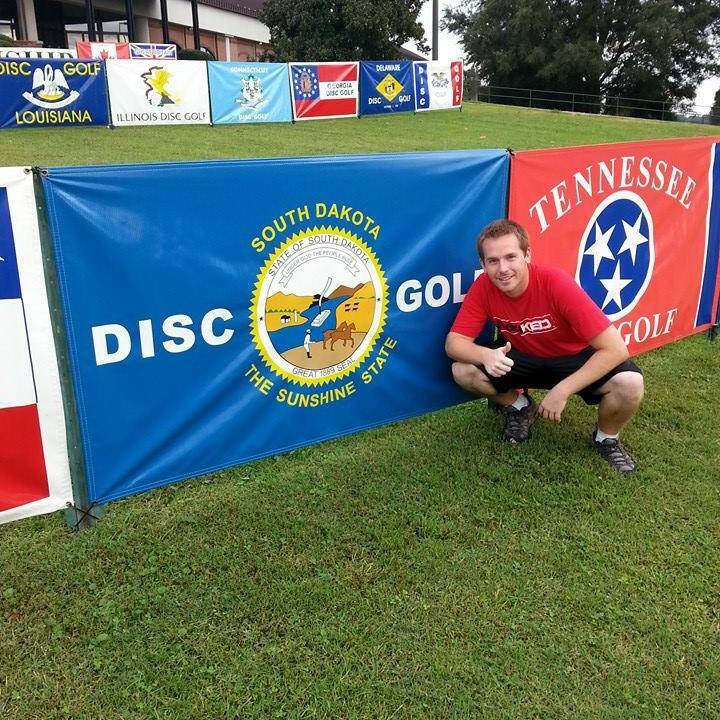 Sahr kneeling next to the South Dakota Disc Golf banner at the USDGC. As Derek Sahr steped up to the cement tee pad of his final hole, in his final tournament of the season with $1500 on the line, the concentration and intensity on his face was apparent. He threw his disc, and it faded to far to left and dropped down into a wooded area. Even with his final tee off of the season being a less than perfect throw Shar turned around smiling. Derek knew about the amount of money on the line, but for him the real prize is being able to play his favorite sport, the money is just a perk. Sahr is one of many people that play disc golf, but there is something different about Sahr. He doesn’t just play disc golf, he competes in tournaments in the open division, the hardest division, and wins. Sahr is one of the few people in this world that can play disc golf almost full time and only have to work a “real” job part time. Created in the 1970’s, disc golf has inherited much of its lingo and rules from golf. Instead of hitting a ball the players throw a Frisbee like disc towards elevated metal baskets. The player with the fewest strokes or ‘throws’ at the end of the game wins. Wit its low cost of entry and recreational nature, it’s understandable how disc golf has grown in popularity in the recent years. “Disc golf is a game of touch and technique,” said Derek Sahr, 22, as he casually putt into a disc golf basket 25 feet away in his basement. Shar spends three hours every night putting to make sure his game doesn’t grow rust during the offseason. Sahr started disc golfing when he was 6 years old. “I remember going out to Augustana College [in Sioux Falls, SD] with my dad and throwing to light poles”. Derek says as he put away his discs. Sioux Falls didn’t have a disc golf course until 2001 when Tuthill was put in. At that time, Tut did not have cement tee pads, instead they had homemade swimming pool like grip pads. Sahr got his first tournament win in 2006 at the age of 13. He remembers going to the tournament director and asking what division he should play in. The tournament director told him the junior division. He beat that same tournament director’s son by 23 strokes to win. According to Sahr, his score would have tied for first place in the open division at that tournament. “The win made me want to investigate more into what disc golf had to offer,”said Sahr. Sahr credits his mental fortitude and go-getting attitude to his friends and family. “It’s good that [Derek] is out there chasing his passion,” said Patti Sahr, Derek’s mom. Patti has always supported his passion for disc golf. Derek remembers on multiple occasions when he would have people from across the country stay at his house for disc golf tournaments, and when they woke up in the morning his mom would have a full breakfast waiting for them, no matter how early they had to wake up. But Sahr’s mom is not the only one he has to thank for his success in disc golf. His best friend and greatest competitor, Taylor Lupton, gave him competition and motivation to continue to grow his game. “We would always play a round or two a day at Tut and put money on the line. Who ever won, won the money,” Lupton said. “Taylor and I would carpool down to Emporia, Kansas for the Glass Blown Open tournament every year,” Sahr said, “It became a tradition. We would stay at the same house, eat at the same restaurants, it even got to the point where we started to wear the same clothes every time we went down there”. Derek is going to continue to improve his game with the ultimate goal of one day make a living only playing disc golf. He has plans to move to Arizona in the next five years so that he can avoid the almost five month offseason. “You can’t play [disc golf] in the winter. It your fingers, the tea pads on the courses are not cleared off and are icy. I want to avoid all of that, that’s why I’m hopefully moving to Arizona soon,” Sahr said.